FIMS and EFSMA are partners of the 6th MEDICA MEDICINE + SPORTS CONFERENCE taking place at MEDICA, the world´s largest medical trade show with more than 128,000 visitors and 5,000 exhibitors. It’s going to be a fully packed 2 days for sports medicine experts, sports scientists and related disciplines. The 6th MEDICA MEDICINE + SPORTS CONFERENCE will open its doors on 13th and 14th of November 2018 in Dusseldorf. The interdisciplinary platform will again be the stage for new sport medical therapies, and innovative approaches in prevention, recovery and exercise for public health. 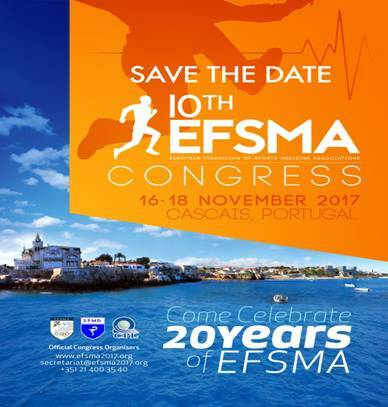 As the 10th.EFSMA Congress is approaching, please save the date in your calender/agenda. Hope to see you all in Estoril in November. at the Estoril Congress Center.